Tonic 15 is an online shop that source an amazing selection of Korean skincare products, making them accessible for all of us skincare lovers in the UK, yay! Jin, the founder of Tonic 15 wanted to help people to have atleast 15 minutes of 'me time' to relax and focus on themselves..
"At TONIC15, our purpose is to provide you with innovative products created by Korean beauty experts to help you reinvigorate, pamper and protect your skin. No matter how busy you are, our 15-minute fixes can help nourish your skin to highlight its natural beauty." I love the message behind the brand, and that they are sourcing the best skincare picks to help us unwind and destress, which is definitely something we all need sometimes! I also love that they have a mix of price ranges on their website too from more luxury picks to afforable bundles, that are perfect for everyones budgets. Now let's get onto the products I've personally been trying out! 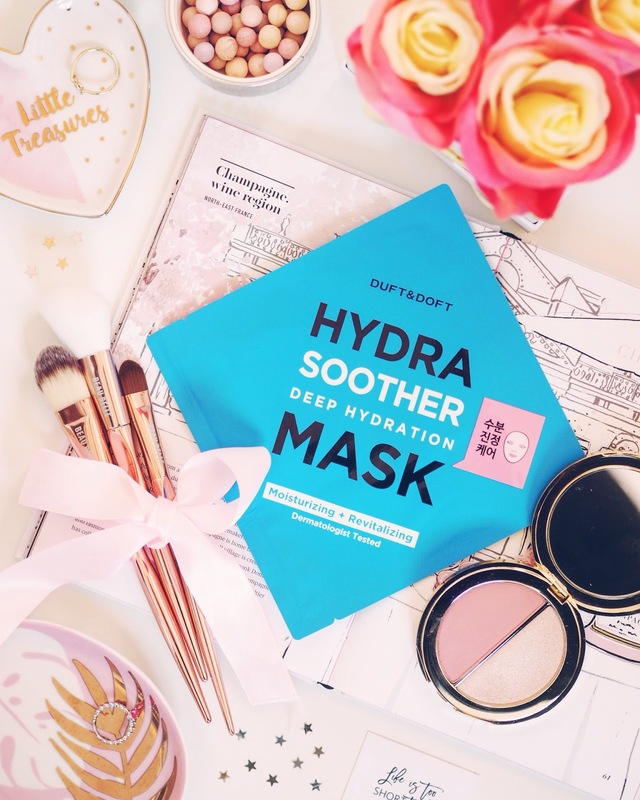 The first product I tried out was the Hydra Soother Deep Hydration mask from Dust and Doft, which is enriched with lots of great ingredients including Aloe Vera, Green Tea and Hyalurolic Acid. It is suitable for dry to sensitive skin, which is exactly my skin type so I was very excited to use this one! Application wise the mask lined up on the face really well, the gap was slightly big round the nose area though but that didn't bother me or seem to affect the results at all. 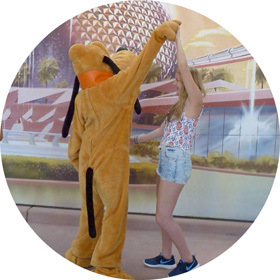 Another thing to mention is that quite a few drops of the liquid in the mask came off onto my clothes as this one really is packed with product, so it's definitely a mask you'll want to be in your pyjamas for! Once it's on the face it feels so cool and refreshing on the skin. This one would definitely be an amazing mask to use after a day in the sun this summer, as it feels so soothing! Once it's off it does have abit more excess product than normal but it's not sticky at all and soaks up into the skin after around 15 minutes. The results were amazing for me, it's like a bottle of hydration for the skin and it left my face looking SO healthy and glowy, and feeling very soft too. I noticed the day after using this my skin still had a really nice healthy glow to it too! So, results wise I really can't fault this one, and would definitely order another in the future. 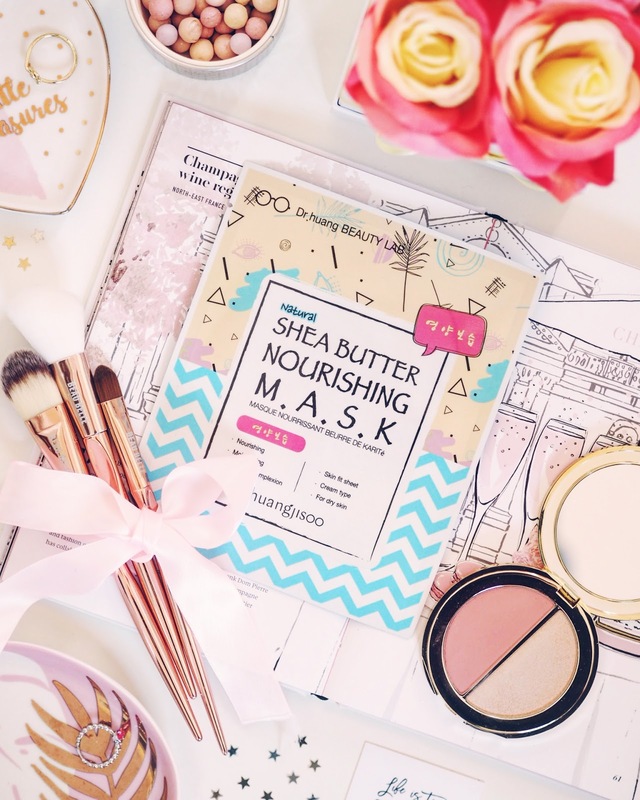 If you're looking for a sheet mask to give your skin a big hydration boost then this is definitely the mask for you! • 38.7% natural real honey. • Bentonite - to remove impurities, and nourish and replenishe elasticity. • Hazelnut oil - to tighten pores. So, lots of amazing ingredients packed into this mask! Appearence and scent wise, this one is soo satisfying. It has an amazing honey and caramel like texture with a gorgeous sweet natural scent to it too. It literally smells good enough to eat! The mask has quite a thick consistensy but it doesn't feel heavy on the skin at all, and applies to the face really smoothly without any patchiness, so it's very easy to get an even coverage of this on the face quickly! Once it's on it feels really soothing on the face, so perfect for when you're in need of a relaxing pamper evening! The packaging recommends you keep the mask on for 10 minutes to an hour, I've personally been keeping it on for around 30/40 minutes as it feels so soothing on the face, you really wont want to take it off! 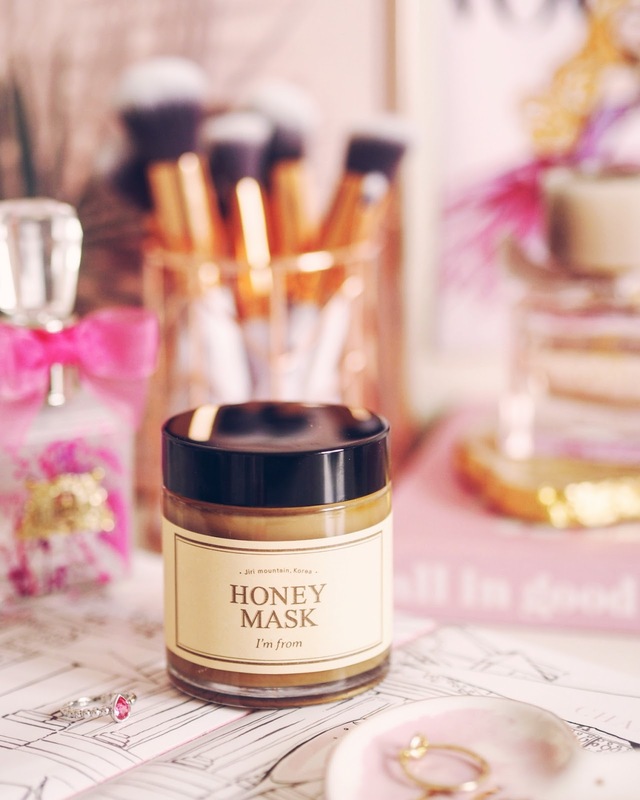 Once it is off my skin always looks really fresh and glowy, so if you're looking for a mask to give tired looking skin a new lease of life then this is definitely the mask for you! My skin feels super soft after using it, not super hydated like the sheet mask but really smooth and bright, perfect for popping on a couple of times a week to give the skin a little TLC. I also find this one is amazing to use before applying any makeup too as it primes the skin perfectly, creating a great foundation base! I'm a big fan, even though it is pricey it really does leave the skin feeling great and a little goes a very long way too. 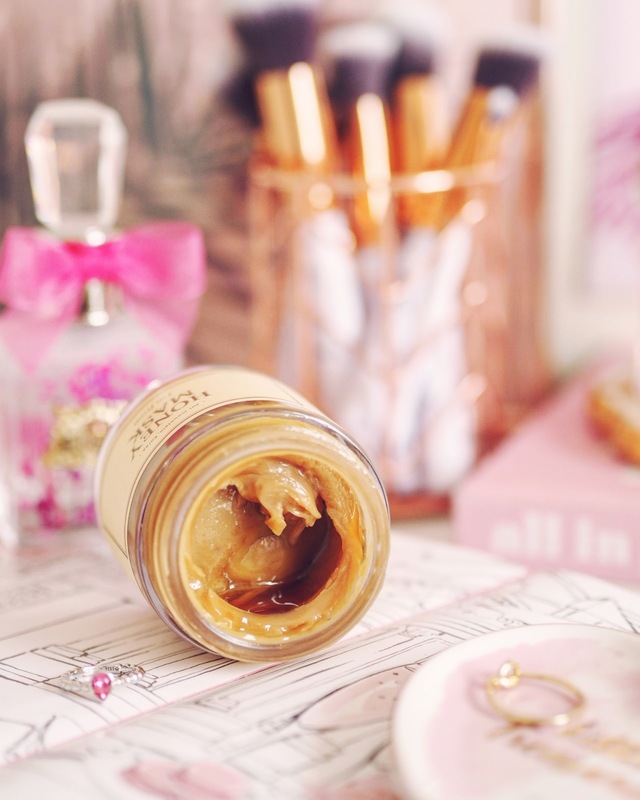 A little jar of heaven for the skin! • Shea Butter - for deep hydration. • Echinacea Angustifolia (Coneflower) - to help with skin cell activation to smooth and moisturize the skin. • Sodium Hyaluronate - to protect the skin from water evaporation to improve dryness and soften the skin texture. Now let's talk about my thoughts! Fit wise this one applies so nicely, it has lots of slits around the mask so you can easily move it around to fit your face shape, I definitely wish more sheet mask brands would get on board with this, it's a game changer! The mask has a lovely almost lavendar like scent, which I'm guessing is the Coneflower? Whatever it is, I love it! I found the scent made the mask feel extra relaxing, it would definitely be the perfect mask to use before bed! After the 15 minutes of pure bliss my skin really did look super glowy and actually a lot brighter too, which is a dream for anyone with a dry skin type like myself, literally magic! I know sheet masks aren't a consistent result unless you're using them routinely but for a quick fix I can't recommend this one enough. My skin also felt very soft and smooth too, and just overall looked alot healthier. I really recommend this one if you're looking for something to brighten dull skin, I have no complaints at all! 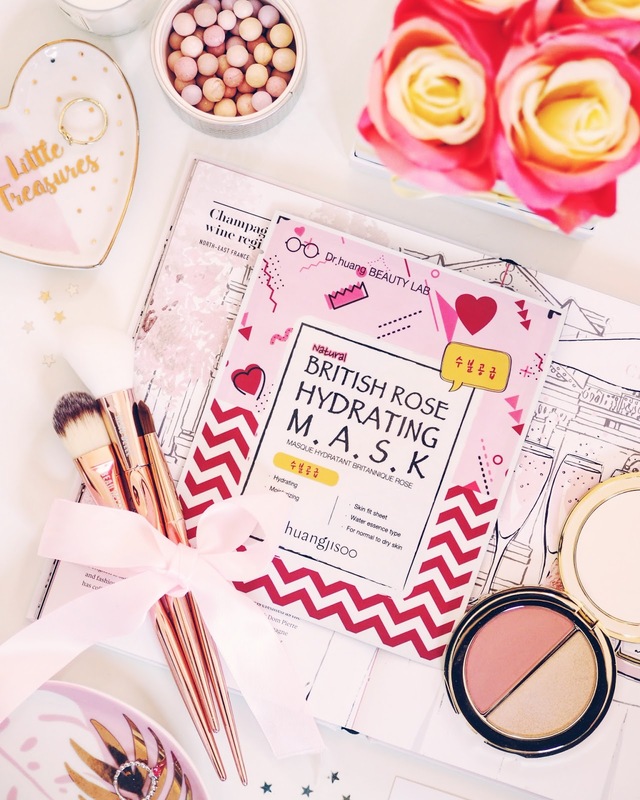 The last mask I picked out to try was the Huangjisoo British Rose hydrating sheet mask, which is targeted at those with normal to dry skin and again contains some really interesting ingredients! • Rose Centifolia (Cabbage Rose) Flower Water - for hydration. • Vitis Vinifera (Grape) Seed Extract - to supply moisture to the skin. • Anthemis Nobilis (Chamomile) Flower Extract - to calm and soothe the skin. •Tremella Focicormis (Mushroom) extract which has the ability - to retain absorb and retrain moisture to more than 500 times its size. So, a great mix of ingredients for the skin in this one. Fit wise, this is exactly like the Shea mask and fits on to the skin so well! It also has a gorgeous rose water scent to it too, which left my skin smelling amazing after. I'm a massive fan of anything rose water scented, and if you are too then you'll absolutely love this one! Results wise, this one seems to pack alot of moisture into my skin and left it feeling so nourished and soft. The downside with this one compared to the other two sheet masks is that it just didn't seem to add much brightness to the skin, it does give the skin a slight glow but it was definitely not as effective as the other masks in that way and faded a lot quicker, if you're looking for a more nourishing and moisturising mask then this a great option though! ... and that's it! I hope you enjoyed hearing about the masks I've been trying out, I'm face mask obsessed at the moment so I've absolutely loved trying out some new ones. If you're a skincare lover like me then I definitely recommend checking out the Tonic 15 website, it really is a skincare fans idea of heaven, packed with lots of different exciting brands! Let me know in the comments if you've tried out any of these products before, and your thoughts?